*Does not include beverage, tax, and gratuity. 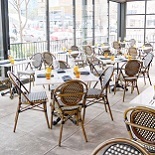 Brasserie du Parc is an authentic French brasserie located on the ground floor of the landmark residential high-rise One Park Place overlooking Discovery Green. During the Alley Theatre’s Picasso at the Lapin Agile production (May 11 through June 3), Brasserie du Parc will present its own prix-fixe Lapin Agile Theater Menu, complete with a rabbit option, of course. The multi-choice dinner is a pre-theater option for people who want to get in the French mood prior to watching the play. Cost is $39 plus beverage, tax, and gratuity. In addition, should anyone prefer the regular menu instead of the special one, you can show your Alley Theatre Picasso at the Lapin Agile tickets and receive a 15% discount off your dining purchases. Reservations are strongly recommended. Top Photo: Alley Resident Company Members Dylan Godwin, who will play Albert Einstein, and Elizabeth Bunch ,who will play Germain, in Picasso at the Lapin Agile at Houston’s Brasserie du Parc. Photo by Lynn Lane.